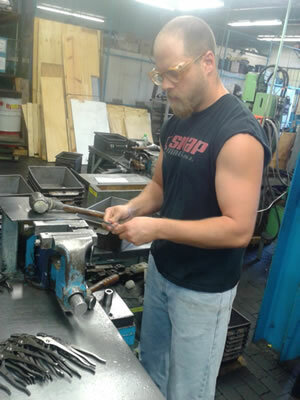 This is one of the many Die Forge tools used to manufacture Channel lock Tools. As opposed to Drop Forged, Die Forging does a much better job making a stronger, precise tool. When this thing is pounding away, and the operator is inserting red hot steel into the dies, the earth literally shakes under your feet. The feeling in your chest as the impact occurs is downright spiritual! Safety is of prime concern for the operators of such huge machines. Devices insure that injuries do not occur although there is no substitute for paying attention. Here individual halves of Channellock #357 end cutters are being made. Just a short amount of forgings ready to go on to the next process of turning these into tools. Despite the fact that there are only three steel parts to this end cutter, the amount of steps to craft the finish product is staggering. Some is done with automation, but people insure the quality and feel of the tool at all steps. Here Chris Hayek adjusts the rivet on some Channellock #426 pliers. Nothing beats the human touch to make a product feel right in the hands of the end user. 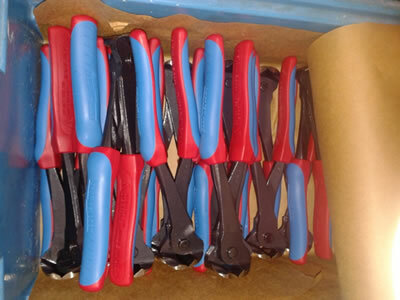 Finished tools are loaded onto racks and dipped in the PVC coating in Channellock Blue. Even this step is carefully inspected to insure a flawless coverage. These are the new Code Blue handles for a more comfortable, positive grip and feel. Same tool, just a different grip that has evolved from customer feedback . As a last step, Rita Seeley packages up each tool. Here she is finalizing some #424 Channellock Tongue and Groove Pliers. A dab of oil, a final inspection check, the insert card, and the plastic pack is snapped shut. Then into boxes and shipment to a store near you. Remember these people next time you are selecting your tools at the store. They make these high quality products for us to do our jobs!